The NHS can’t afford to fund every new medical treatment. Budgets are limited. Resources are finite. It’s a boring fact of life, from which people like me – economists – benefit. In recent years the UK has championed the provision of cost-effective healthcare. The efficiency of the NHS owes no small thanks to NICE, which evaluates health technologies for all kinds of conditions. To do so they need to be able to compare these technologies with each other. The general consensus amongst health economists, and the approach adopted by NICE, is to use quality-adjusted life years (QALYs). QALYs are required by the NICE reference case and we have excellent tools such as the EQ-5D to capture these. The use of QALYs as an outcome is almost ubiquitous in the evaluation of health technologies. So much so that they have come to define cost-effectiveness. The area in which their use and study appears most limited is in mental health research. Herein lies a problem: from the decision-makers perspective, not knowing whether an intervention is cost-effective isn’t all that different from knowing that it isn’t. Health technologies are competing for the same pot of NHS money and are therefore pitted against each other, regardless of dissimilarities in the conditions they treat. We therefore need an outcome measure that is relevant to all conditions; from baldness to bunions; abdominal pain to Zellweger syndrome. We need an outcome measure that is ‘generic’. For economists (and to some extent decision-makers), preferences are paramount. A hypothetical change in an individual’s health only matters if they (or, in practice, the public) actually assign any value to this health change. As such, the last few decades have witnessed the rise of generic preference-based measures. The EQ-5D is the most well-know of these, but others do exist. These measures enable researchers to calculate the benefits of an intervention in terms of quality and length of life – combined in to one number. Decision-makers are then presented with an illuminating ‘cost-per-QALY’ of an intervention. Such a minimalist result is of great value in funding decisions. Unfortunately, in many cases, economic evaluations in mental health are not armed with this figure. This is no doubt detrimental to future provision and research. Mental health researchers’ apparent unawareness of generic preference-based measures is justifiable. The EQ-5D, for example, only includes a single question relating to mental health. There are also greater methodological problems with using generic preference-based measures in mental health; are public values representative of patients’ preferences; can severe patients understand the questions; are ‘general’ questions even relevant? There are certainly pros and cons to using a measure like the EQ-5D in mental health research1. Fortunately there’s a happy medium that still allows for the calculation of QALYs and, therefore, the generic valuation of mental health technologies. Condition-specific preference-based measures. These measures capture changes in an individual’s quality of life based on dimensions relevant to specific conditions. The development of a preference-based measure involves two stages: development of the classification system (questionnaire) and the elicitation of values. Unfortunately most existing measures have only completed the first stage. Nonetheless, measures do exist and I implore you to research them further, get involved in their development and include them in your studies. There are measures under development that are specific to particular mental health problems, such as DEMQOL: a quality of life measure for individuals with dementia2. Some of the most promising work relates to the development of preference-based measures that are specific to mental health but general across disorders. This work includes development of a preference-based measure from the CORE-OM3,4. Unfortunately these measures are almost solely employed and researched by economists. Researchers involved in the evaluation of interventions for mental health need to champion these measures, as economists alone cannot. If you’re a researcher, why not try to include fledgling preference-based measures (both general and condition-specific) in your studies, and aid their development. Cost-effectiveness is often an ‘unknown’ in mental health. This is no longer acceptable. If mental health research and care is to obtain the funding it needs, then researchers will have to bend to accommodate these methods and engage with economists. If you do nothing else please read this5, then read this6, and do not forget to read this7. The long-term benefits could be huge. 1 Brazier, J., 2010. Is the EQ-5D fit for purpose in mental health? The British Journal of Psychiatry, 197(5), pp.348-9. 5 Brazier, J., 2008. Measuring and valuing mental health for use in economic evaluation. Journal of health services research & policy, 13 Suppl 3, pp.70-5. 7 Chisholm, D., Healey, A. & Knapp, M., 1997. QALYs and mental health care. Social psychiatry and psychiatric epidemiology, 32(2), pp.68-75. I was at an NHS meeting the other day amid a heated discussion about the importance of integrating healthcare needs across the physical/mental health divide. After I made a point about the importance of centring health strategy on the basis of clinical need (i.e. on the needs and priorities of those who actually use the service), one person commented that “business decisions and clinical decisions are not always compatible” and that “health commissioners tell us they don’t want a Rolls Royce service but are quite happy with a Mini”. Reflecting on this, I was struck by a quite fundamental question: are clinical and business outcomes really that incompatible? And can we really polarise the options in terms of either/or extremes? Last week on the IMH blog Sam Watson posted about the moral costs of doing nothing in healthcare, and the author made some cogent arguments for finding a “quantifiable way of measuring the benefit from all government spending and then choosing the health care budget based on this”. Whilst we are a long way from achieving this in practice, there is a clear recognition that clinical needs and business needs are, indeed, inseparable. In my own field of clinical health psychology, one of the central issues at the moment is the cost to the health care system in terms of what have been called “Medically Unexplained Symptoms” (a horrible term by the way, but that’s for another post!). These are people who experience considerable physical disability and pain, but often without any identifiable organic (medical) basis. They are usually very distressed individuals, often for good reason; not only are they seen by some medical professionals as malingers and time wasters, they are rarely given a convincing explanation for their symptoms which truly does justice to the manifold complexity of the relationship between body and brain. Pain is very rarely “in your head” but neither can it ever be “just” physical. Furthermore, and perhaps even more confusing for these clients, it is often entirely arbitrary whether they end up in a mental health service, or in a physical health psychology speciality like mine. Sometimes they will present at both, alongside frequent attendance at hospital and GP surgeries. Ultimately, this costs more in terms of duplication of services, not to mention the cost of specialist medical assessment and expertise. Much of this can be avoided by timely, and coordinated, interventions at an early stage in the process. As we all know, this costs money; but can it really be argued that this is money badly invested? In thinking about all of this further I realised that I wouldn’t pay for either a Rolls Royce or a Mini. I want what I suspect most people want when they buy a car: something that will not cost too much money up front, but will also not cost a small fortune in the long run. After all, you a can pick up a Rover 400 pretty cheap at the moment; but let’s be honest here, who among us are likely to invest in a car that will probably result in expensive and frequent trips to the garage, not to mention the stress and hassle that goes with it? I’m guessing that health commissioners, being human after all, are probably not that different either. But being human implies a certain temptation to plumb for the cheap option in the hope that this time, maybe, perhaps, things will be different. With the massive changes sweeping the NHS at the moment, I hope we don’t lose sight of this simple truth: things are usually cheap for a reason, and will probably cost us more in the long-term. There really are no short-cuts here; complex needs cost. This is an excellent post written by Sam Watson, a blogger on the Academic Health Economists’ Blog posted on 16 February 2012 entitled ‘The Ethics of Doing Nothing’. In the post, Sam reflects about the ethics of non-action in health care provision. Though the arguments put forward mostly relate to physical health care, there are some relevant issues to consider in reference to mental health treatment. An example of this would be the justification often put forward to funding commissioners regarding the funding of expensive treatments and services such as Children and Adolescent Mental Health and Early Intervention. As many health care providers will argue, provision at early stages of mental distress may not only prevent future (and more substantial) problems but also can contribute to a better quality of life. This, ultimately, can also provide savings in the longer term (e.g. less service use in adulthood) and in other areas of social care (e.g. dependence of the welfare state). But the problem always comes back to this: with limited amount of funds and resources, how can you justify putting money into services that offer benefits well outside the time cycle of short-term budget reviews, as well as in areas which may have no direct bearing on health care? Conversely perhaps, how can you quantify quality of life and is this something you can even put a price tag on? Yet is doing nothing the better alternative? Have a read of the post and let us know your thoughts! Can we reasonably consider ‘doing nothing’ as an alternative course of action? In many cost-effectiveness analyses the intervention under consideration is compared against a ‘doing nothing’ scenario, although frequently the next best alternative is used. Ultimately the health technology assessment carried out by NICE is an informative effort and the final decision is made by the budget holder. However, NICE makes each assessment in isolation of each other and so prioritising treatments is left to the budget holder. But can the budget holder choose a ‘do nothing’ option, and should this option be considered at all in cost-effectiveness analysis? This may come down to an issue on the role of the health care system in general. One of the principle tenets of NICE and the NHS is justice (the others being beneficence, non-maleficence, and autonomy). This NHS justice, it seems, is a sense of justice as described by John Rawls – justice as fairness. Justice as fairness is founded on two points – liberty and equality, that everyone should have the same right to basic liberties, and that inequalities should be arranged to benefit the worst off in society to ensure distributive justice. Both of these principles are satisfied by the idea of access to health care based on need and regardless of ability to pay. We use cost-effectiveness analysis to best allocate resources, so that we all get the greatest gain for our limited resources, but that does not necessarily ensure that the worst off get priority. In the end it comes down to a deontologism versus consequentialism debate. Deontologism dictates that there are certain moral rules that must be followed, or as Kant described them ‘categorical imperatives’, and these rules can be reached through logical reasoning and must be universal. In this case, for example, if doing nothing were universally permissible for health care professionals then it would be permissible for no-one to be treated which would negate the existence of the health care professional in the first place. So, if we say that all those with needs must be treated, this may be a deontological stance. However, we do not provide services for all those with needs, and it may be practically impossible to do so. Health care provision is proportional to need, but those with the least needs generally have to pay for their own services, unless they are sufficiently poor, for example, dentistry. Now, if we consider health care provision to be philosophically consequentialist, can we allow a ‘do nothing’ option? Many thought experiments exist to exercise consequentialist ethics. Consider a runaway train, it’s careering down the track towards a station in which there are ten people who will die if the train gets there, you are on the train and have the option to switch tracks to divert the train away from the station. However, there are three men working on the line on the other track who will die if you pull the lever. Do you pull the lever? One argument, the utilitarian one, would say yes. The total loss would be smaller on the other track, we would therefore be maximising the total utility from the situation. Another argument may say though that not pulling the lever is the only option since if you did the deaths of the three men would be your responsibility but in doing nothing you would be morally neutral. This is a form of egoistic consequentialism. Under both these arguments a health care provider could do nothing, in the first case if utility was maximised by treating others and in the second case because the health care provider is not morally responsible for a person’s health care state in the first place. There are objections to this line of reasoning. Peter Singer describes a situation to illustrate an objection to this. Imagine you are walking home one day. As you walk you pass a pond in which a child is drowning. The pond is not very deep and you could walk in and save the child, bearing no tangible risk to your own life. In this case the choice of inaction would lead to the child’s death, and you surely could be held responsible for that. The choice of doing nothing, then, does not negate responsibility. Moreover, if the budget holder is the government, there are certainly arguments which may attribute to them a certain responsibility for poor health in the population (consider the relationship between the macroeconomy and health). The key issue that remains is opportunity cost. The only reasonable argument for doing nothing is that the time and resources could be better spent elsewhere, and cost-effectiveness analysis provides us with the information to know where it is best spent. However, in reality, no patient would be left to die if they turned up to a hospital and could be saved, and many adult intensive care units intervene in ways that are not cost-effective as per the NICE definition. The end of life is the most difficult to deal with, research has shown that people value a change from 0.2-0.4 QALYs more than they value a change from 0.6-0.8 QALYs. Many expensive life prolonging cancer drugs are not funded by the NHS, but there are cases of successful lobbying to have these drugs reimbursed despite their lack of cost-effectiveness. This could lead us to conclude that doing nothing is fine as long as it does not kill the patient (or allow the patient to die, depending on your stance) in which case we should always intervene. It is unfair to ask a health care professional not to act, since, as detailed, it is their responsibility if their patient dies through inaction. For the most part, everybody is provided with the necessary treatment when they are in need. It’s really only at the end of life the problem of opportunity cost is apparent due to the high cost of interventions. Perhaps the answer lies in allowing NICE to negotiate the price of drugs, although this would not necessarily lead to price reductions since companies would be incentivised to pitch drugs at an even higher price knowing that they will be negotiated down to their acceptable price. To the contrary though it may be argued that this constitutes inaction on the part of NICE, and by negotiating (or at least trying to) they could allow more people to survive. Another issue is that the few months that are gained by (usually expensive) end of life treatment are usually in very poor quality. From an Aristotelian perspective this would not be a virtuous choice, as we would not be achieving ‘the good life’, and what’s more, Aristotle says, no-one would actually choose this state of suffering unless they were defending a philosophical position. In the end we may defend ‘doing nothing’ as a choice as it may be necessary in the face of opportunity cost, and it is always better to know the outcomes from as many scenarios as possible when modelling it in simulation based studies. However, in practice ‘doing nothing’ may not be realisable, since the fear of death may prohibit people from accepting this option. Perhaps there is a case for allocating more resources to health care from other areas of public spending, which there certainly is a case for. What would be ideal would be a quantifiable way of measuring the benefit from all government spending and then choosing the health care budget based on this. But this is definitely a long way from reality. In her second blog post, Victoria Tischler, the Institute’s arts co-ordinator, writes about shortlisted applicants who each have a vision of representing mental health in a sculpture. She also talks about the annual Koestler awards at Rampton and gives us a description of the inside of the new building! For more information about commissioning an artwork to mark the opening of the new headquarters, please see Victoria’s post from 2 March 2012. We’ve now shortlisted 4 artists for the project. I know that I previously said we’d shortlist 3 but we had 50 very good applications so it was an extremely difficult task. Neil Walker from the Djanogly gallery, Paul Crawford, Nick Manning, Tim Harris, medical student Abdi Mohamud and artist Rob van Beek joined me on the panel for the arduous yet enjoyable deliberations. The 4 are very different in vision, technique and use of materials. We have included individuals who are conventional sculptors and others who are more conceptual. All responded persuasively to the brief. They are now visiting Nottingham to see the site and to consult with people who have experience of mental health difficulties and who are interested in art in order to prepare their maquettes. I have met with 2 artists so far to look at the proposed sculpture site, next to the IMH front entrance, and will meet the other 2 over the next few weeks. I’ve responded to lots of questions about the Institute and about mental health. This has included topics such as diagnostic criteria, clinical environments, different types of mental health professionals, and current and historical approaches to treatment. One artist is looking at brain imaging material kindly provided by my colleague Lena Palaniyappan. I have referred technical queries about the site to my colleagues in the Estates office. I am looking forward to seeing the maquettes when they are ready on the 2nd May. These will be in the lobby of Sir Colin Campbell building for you to look at before they move with us to the new building in late May. Images will be put on the IMH website. Please do have a look and send your comments in. Let me know what you like and what you don’t! I visited Rampton hospital recently to consult with patients about the project. I gave out the annual Koestler awards and told the assembled gathering about the project. I then looked at some of the award-winning art and talked to artists about their work. Several people had given the sculpture a lot of thought and I collected some excellent ideas about how the sculpture might look, what it should be made of, and what it should represent. I collated these and will distribute to the shortlisted artists. I am also going to keep people at Rampton posted about the project via regular updates. I was lucky enough to visit the site of the new build last week. 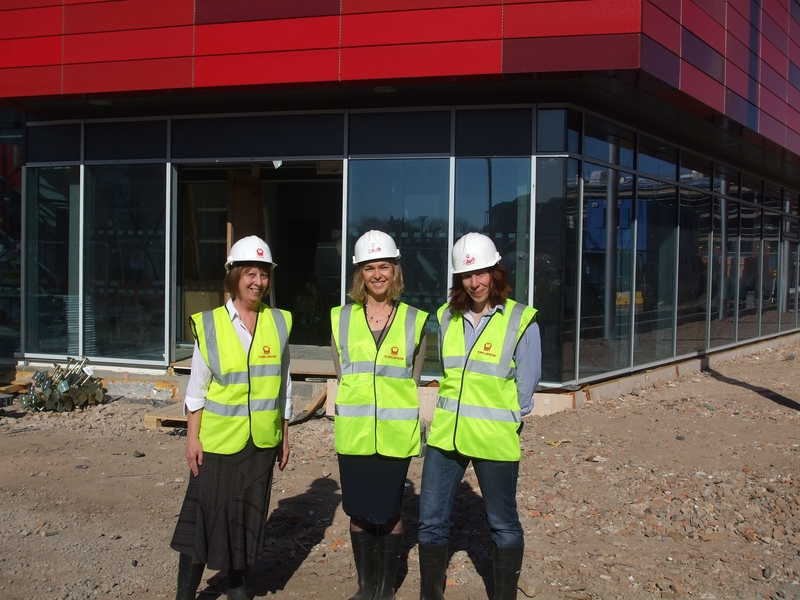 Here I am with Susan Dominic (Division of Psychiatry) and Kate Duncan (City Arts) complete with hard hat and steel-toed boots. It was fascinating to look through the building and its surrounds accompanied by Ian from the construction team, Richard Wigginton (Estates), Gerry Carton, Keith Dorn, Maria Nikolaou and Lorna Viikna. The site is a hive of activity and even though it is not yet complete I can report that the building is spacious, with interesting angles, and full of light. From the top floor (D) you can see right over to Wollaton Hall. The ground floor has an undulating corridor where we will hang art work. We also found lots more space to hang work so we can increase the amount of art displayed in the Institute’s exhibitions. I cant wait to move in to my new office on C floor in a few weeks time.